I live in the Basque Country, in northern Spain. Many eurorack modules diy, they have done that I know axoloti. random noise, deep atmospheres and various experiments. I do not speak English very well, but I'm glad to see Spanish-speaking people in the comunity. Many doubt that will try to resolve slowly. So, that's fast, package delivered today. Just went through the demo's, already cool stuff there. Looking forward to a longer test drive this weekend. Howdy. I am Thomas Margolf, German but live in the Netherlands (Rotterdam). Next to developing i enjoy making and experimenting with music. I'm sure the Axoloti fits perfect into all my DIY stuff. And maybe i can also integrate it somehow into my Nerdsynth. I'm part of Befaco.org. An open hardware Eurorack community and residence project of the Hangar.org Art center. For some reason I just saw this thread :). I am Matt, I live on the west coast in the US (Seattle). During the day for the last 20 years I've been making video games, while at night I have been doing music (except for the 10 year break in the evening to raise kids ... its a lot of work, kids). I recently just started to get back into music and dove head first into eurorack and DIY synths. Axoloti kept popping up in various threads so I grabbed one. Pretty excited about the possibilities. I'm also from western Washington. I'm an experimental musician, synthesist, and DIY hardware mangler. I've been interested in building my own digital synthesizers but I can't code to save my life. I'm hoping to use Axoloti to experiment with modal synthesis, generative patches, and complex intermodulation and drones. Hi everyone, here's Stefano from Italy. I do elettronic music in general, but Psytrance the most. Well, I'm still a newbie at modulars and trying to get something useful out of logic modules at the moment...anyway...having BIIIIG fun! Congrats to the maker and all developers working on this platform...I just started scratching the surface yesterday but I understood it does HUGE things!!! btw, I've got a firmware update that allows the Virus to be connected via USB to the Axoloti. Hi yall! electronic "musician" from sweden here, been doing alot of techno-ish tracks lately and also alot of sounddesigning and experimentation. just ordered an axoloti board, after lookin at the nord modular for years (never could afford it and the editor seems like a hassle). Hoping that it will make nice addition to my quite humble hardware setup, both live and in the studio. Hi Axolotians! I'm Bob from Holland, city of Delft. Been making music all my life. After 25 of playing guitar I became interested in synths and sequencing (in the ninetees, Cubase on AtariST). Studied electronics for a few years. My first "synth" was at age 10: an electronic experimenting kit for kids. Last year I build my first real synth, a Shruthi, from Olivier in Paris. When I read about Axo, I immediately ordered one. Been twiddeling ever since. Fascinating. Got myself a tiny labo on my desk. This is Manu, another member of Befaco team in Barcelona. Looking forward using this lovely thingie!! I'm Pete from the UK. I'm a software engineer that has worked in audio for a while (sadly not at the moment). I worked on sound card device drivers for a while, then audio middleware for games. My names on a few games as part of the audio team. I've played around with SynthMaker, Reaktor and now Axoloti which is proving interesting try to do stuff I've done elsewhere. just bought an Axoloti board. I'm a|x, from London UK. Been making electronic music as a hobbyist for a long time. Recently got into Euro, so I'm particularly interested in integrating my Axoloti into my ever-growing Eurorack setup. Just got my 2 board in the mail today. I'm Bruno from Lisbon, PT. Former MaxMSP / PD / Supercollider enthusiast wanting to get away from the computer to make some noises on my free time. Hi, I'm Nicolas from Ghent, Belgium - Home of the Axoloti. Are from Norway here. I got my Axoloti yesterday, and today I've been trying it out. Big fun! I've been into programming, electronics and synths for 35 years now, both professionally and as a hobby. I just recently discovered the Axoloti, and just had to have one straight away. The fact that it's ARM based warms my old Acornist's heart. I used to do lots of ARM assembly programming on the Archimedes and Risc PC. Been programming some for the 56k, 21xx and 21xxx DSPs as well. 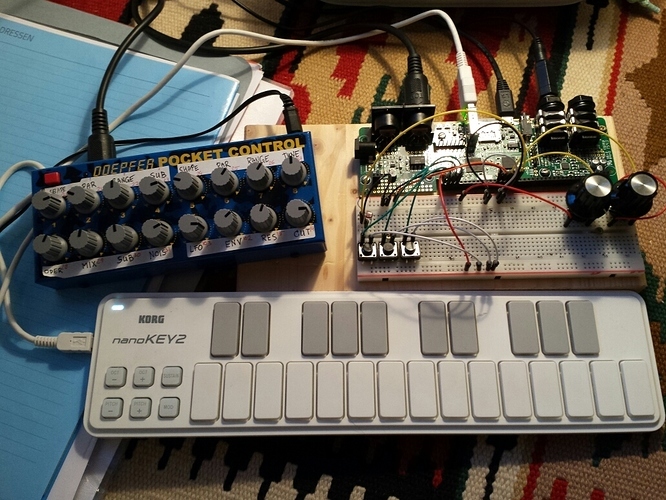 Apart from experimenting and having fun with the Axoloti, I plan to use it as the basis for a portable synth for those camping jams (well, that's also experimental and fun of course...). I'll see you folks around the forums. John from York here. I placed an order last week, so I'm waiting expectantly I have a background in electronic engineering and software engineering (well, that's my job!) but am also interested in experimental music/noise/drone etc. as a performer. I've been using Reaktor for a number of years now, so I hope that the transition to the Axoloti patcher is not too painful. I have various recordings available on bandcamp (as namke communications) including last year's project which was to create a 'sound a day' - 365 pieces of music/sound later it is done and I have some spare time finally!! !